Today we welcome a wonderful author who embraces writing with the tongue in cheek, Beth Andrews (a.k.a. Paul Bethel), to share with us his adaptation of one of Jane Austen’s lesser discussed works. And don’t forget to enter for a chance to win a copy below! If anyone reads my adaptation, Love and Freindship, and Other Delusions, expecting a typical regency romance, they will be bitterly disappointed. Like the original, it is a satire from start to finish. Having written five regency romances and two regency whodunits, I wanted to do something that was both funny and serious. I always enjoyed Jane’s juvenile fiction, and Love and Freindship has a crude but pungent didacticism that only hints at the more subtle work to come. As this story shows, Jane Austen may well be more relevant today than ever before. Her view of love and marriage remains outside of the mainstream, both socially and artistically—which has always been a big part of her appeal to me. The only time she becomes “trendy” is when the movies mercilessly romanticize her fiction to make it acceptable to the general public. I’m not sure that she would have been amused. In an age addicted to romance, we readily dismiss as priggish, for example, Lizzy Bennet’s comment on Lydia and Wickham’s future, that “little of permanent happiness could belong to a couple . . . brought together because their passions were stronger than their virtue.” For most contemporary readers, passion (from a word meaning “suffering”) is itself a virtue—perhaps the only one any longer permissible. Jane Austen knew, however, that romantic passion is like a Fourth of July fireworks display: exploding brightly for a brief instant, then falling to earth in a pile of ashes. That may do for a pleasurable sexual encounter, but it is worse than useless as a motive for the Herculean task of building a marriage. This philosophy alienated many of the great Victorian novelists. Jane would probably have been highly entertained by the antics of Heathcliff and Catherine, and their gloriously dysfunctional relationship, but would have considered Hareton and young Cathy more promising prospects for a happy marriage. I’m convinced that Emily Bronte actually felt the same, and that Wuthering Heights was intended to show (to paraphrase de Rougemont) that when love becomes a god, it becomes a demon. Personally, my heart leaps up when Elinor declares to Marianne that “it is not meant—it is not fit—it is not possible” for one’s happiness to depend entirely on one particular person, however “bewitching” the idea. O blessed Elinor! No other major novelist has had the intestinal fortitude to create a heroine so ruthlessly unsentimental. Neither Elinor nor her creator would ever advise anyone to “follow their heart,” for instance. Such meaningless claptrap was beneath them. K. Chesterton has said that Jane Austen “could keep her head” while the women writers who followed her “went looking for their brains.” Alas, both male and female writers are still looking for their brains—in all the wrong places. One of the things Jane was saying (and what Love and Freindship has inspired me to say, in my own small way) is this: First, when making major choices in your life, like whom you should marry, your brain should be consulted as well as your heart. Second, neither your brain nor your heart is located below your waist; and if you insist on being led by that particular portion of your anatomy, you have no right to expect a happy outcome. Studies consistently show that in countries where arranged marriages are common, divorce rates are lower and marital happiness greater. But don’t we all know (courtesy of Pride and Prejudice) that “happiness in marriage is entirely a matter of chance”? After all, Jane Austen had learned from her beloved Dr. Johnson that marriage is only unhappy because life is unhappy. So keep calm and get over it already! As civilization disintegrates around me, I turn again to Jane, who is as solid as the Rock of Gibraltar and shines as brightly as the Evening Star. Beth Andrews (a.k.a. Paul Bethel) was born in Nassau, Bahamas, in 1958. 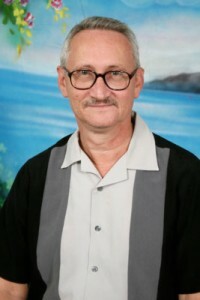 While holding various jobs—newspaper sub-editor, accountant, assistant manager in a music store, receptionist and sales clerk—he managed to write nine novels/novellas, seven of which have been published under his pen name of Beth Andrews (which he wishes he had never chosen, since so many other authors have adopted it as well). 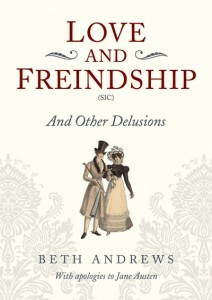 Only his most recent book, Love and Freindship, and Other Delusions, is currently in print. Like most of his book-length fiction, it was published by Robert Hale Limited, London, England. An audio book version is now available, and a large-print edition should be released within the next year. Paul enjoys reading, writing, classic films, occasional travel, a little gardening, beach-going and other forms of time-wasting. He is still deciding whether or not to write another book, considering that this might be rather more of a waste of time then even he can stomach. He has had a number of short stories, articles and even poems published in various U.S. and U.K. magazines over the years, most of which are quite forgettable.